This is the excellent new Mercedes GLS which comes with new styling, a fresh cabin and replaces the well-regarded GL-Class. It’s a seven-seat luxury SUV which will be appearing on our roads from next March but is available to order now; prices start at £69,000. Mercedes says its vehicle will set new standards and claims it will be the ‘S -Class among SUVs’. Those are bold claims but the new premium vehicle has more agile dynamics and lots more comfort than the GL and, Mercedes says, the GLS will offer best in class safety. In addition, the new GLS has the firm’s Airmatic air suspension system along with adaptive damping, a nine-speed auto gearbox and the latest driver assistance systems. British drivers will get to choose from three models and the standard specification is, as one would expect, comprehensive. Standard equipment for the Mercedes GLS includes an 8-inch screen and touchpad, leather upholstery, panoramic electric sunroof, a parking camera and a surround sound system. There’s also climate control for three zones, heated seats and ambient lighting. Other models come with heated and cooled front seats, four zone climate control and heated steering wheel. There’s also temperature controlled cup holders and active suspension stabilisers to reduce the rolling motion on bends at high speed. Drivers also get to choose from various personalisation options which do not cost extra and offer five different colour choices for the leather upholstery and four wooden trim finishes. Safety kit includes blindspot assist as well as lane keeping assist. Under the bonnet, Mercedes has added a 3.0 litre V6 diesel unit which produces 258 HP for the GLS 350d. This should prove to be a good performer and there’s an optional off-road package available which will add a centre differential lock, extra driving modes and a low range gearbox. There’s also three extra separate heights that can be set for the suspension to help improve ground clearance and wading abilities. Other models come with the firm’s 5.5 litre bi-turbo V8, this is fitted to the Mercedes GLS 63 and comes with more power and more equipment on board. 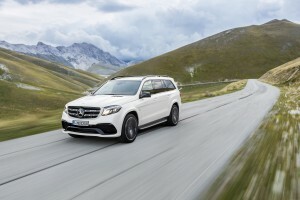 There’s also the Mercedes GLS AMG Line available with illuminated side running boards, larger alloy wheels and a more distinctive exterior styling. On board the GLS there is space for seven passengers and a large boot – with all rear seats folded flat the boot extends to a huge 2,300litres. While the new Mercedes GLS is replacing the GL-Class, it’s really Mercedes’ answer to growing competition, particularly from the Audi Q7, and while the exterior is similar, the interior has been radically revamped to create a more comfortable and impressive cabin. This entry was posted in News and Views and tagged Mercedes GLS by Steve Lumley. Bookmark the permalink.